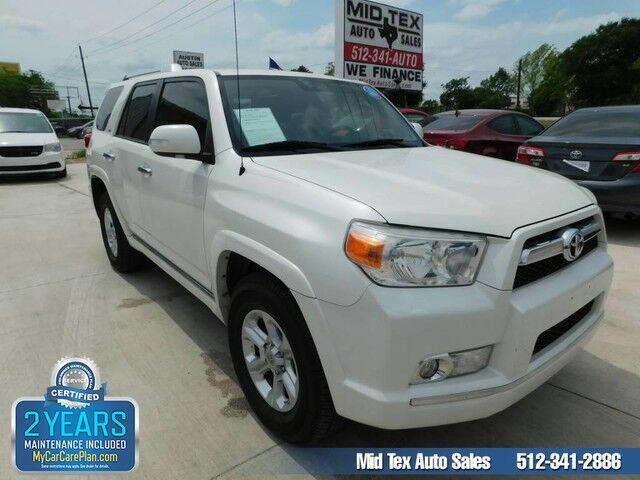 Check out this gently-used 2011 Toyota 4Runner we recently got in. CARFAX BuyBack Guarantee is reassurance that any major issues with this vehicle will show on CARFAX report. This SUV is a superb example of what a tough, work focused vehicle should be. Exceptional towing, acceleration and torque will help you get the job done. The Toyota 4Runner SR5 will provide you with everything you have always wanted in a car -- Quality, Reliability, and Character. More information about the 2011 Toyota 4Runner: The Toyota 4Runner debuted in the U.S. more than 25 years ago. Now in its fifth generation, this midsized SUV uses the same platform as the FJ Cruiser and maintains its truck-like body-on-frame construction. A third row of seats is available and both the second and third rows fold completely flat without having to remove the headrests, providing a cavernous 90 cubic feet of cargo space. The optional sliding rear cargo deck can support up to 440 pounds. This model sets itself apart with smooth and comfortable ride, Great combination of truck-like performance and car-like agility, incredible off-road handling and capability, and increased durability and strength Visit Mid Tex Auto Sales online at www.midtexautosales.com to see more pictures of this vehicle or call us at 512-341-2886 today to schedule your test drive.